Special Report | Did Zionist hackers bring down our Russell Tribunal website? Last week, hacktivist outfit 'Anonymous' temporarily disabled the websites of the Israel Defence Force and Mossad, causing much embarrassment to Israel. A few days later, a cyber attack brought down the website of the Russell Tribunal on Palestine. In an exclusive report, the website's designer, Harry Fear, says this was no amateur job but a highly sophisticated attack. last week has seen two significant cyber attacks occur, both relating to the Israel-Palestine conflict. After Israel hijacked two Gaza-bound humanitarian vessels, the Canadian ‘Tahrir’ and Irish ‘Saoirse’, the hacktivist outfit Anonymous hijacked and temporarily disabled the websites of the Israel Defence Force and Mossad, causing much embarrassment to Israel. This weekend saw the South African session of the Russell Tribunal on Palestine, a people’s tribunal, which sought to assess the prima facie evidence against Israel regarding the crime of apartheid. The tribunal took evidence from Arab-Israeli Knesset member Haneen Zoabi and Israeli activist Jeff Halper of the Israeli Committee Against House Demolitions, among others of high esteem. As the Tribunal took evidence its website was under attack by unknown hackers, resulting in a total deactivation of the website. Even now, users trying to visit the website are redirected to a dead end. Last year I volunteered my services to the Russell Tribunal and set up their website. Before I started my career in documentary-making I worked as an internet presence consultant and trained in website security. As such, I ensured that the website had an impressive level of cyber defences to guard against expected attacks. Thankfully, these defences have held water and the (malignant, presumably pro-Zionist) hackers were unable to attack the website itself. Instead, the hackers seem to have gained control of the systems at 1&1 Internet Ltd., the company with whom the Tribunal holds its domain name. Inside 1&1’s systems the attackers hijacked the Tribunal’s domain name, redirecting it to a fallacious web address that corresponds to the viewer’s own computer. 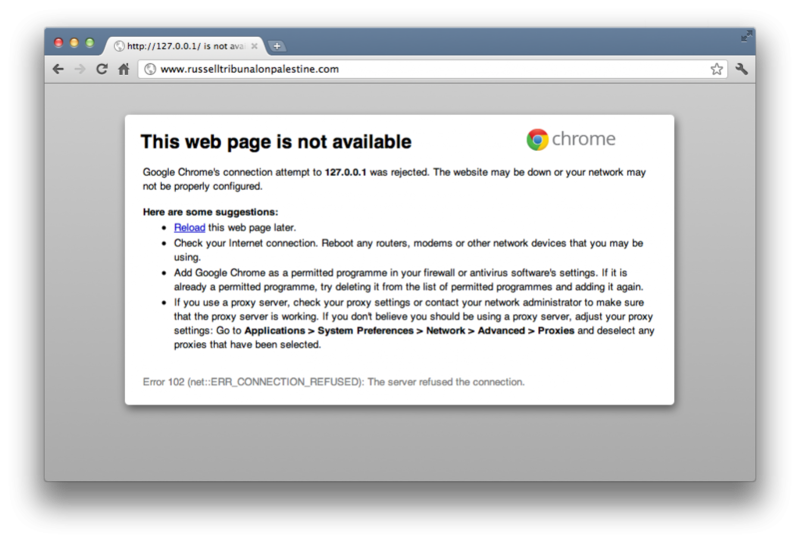 Put simply: anyone trying to visit the Tribunal’s website ends up at an error page (see above). This attack is very sophisticated and no amateur attempt. The ability of the hackers to seemingly compromise the systems at 1&1 Internet Ltd., a large and esteemed multinational company, indicates the complexity of the attack and the hacker’s considerable resolve. It’s early days to know for certain what has happened. But from what we’ve seen so far, this story is far from over. Harry Fear is a documentary maker and activist based in the UK. His website is www.harryfear.co.uk. When can we see things back to normal?